As the mass protests in Iran surged during its first week, the various groups comprising the Iran lobbying effort stepped up their own efforts in trying to find any message that might prove effective in blunting the awful scenes of ordinary Iranian citizens battling regime security forces. The National Iranian American Council’s Trita Parsi was one of the busiest regime boosters in that period, appearing on a glut of news programs in an effort to portray the protests as less a response to the mullahs’ brutal policies, but rather a manipulation by outside forces such the Trump administration, incidentally, almost exactly what Ali Khamenei, Iranian regime’s supreme leader claimed at the end of the 2nd week of uprising in Iran. In Huffington Post, Parsi blamed a nuclear deal that was overwhelmingly supported by the Iranian public, but failed to deliver on its economic promises because of obstruction by the U.S. and conservative Republicans hawkish against the regime. 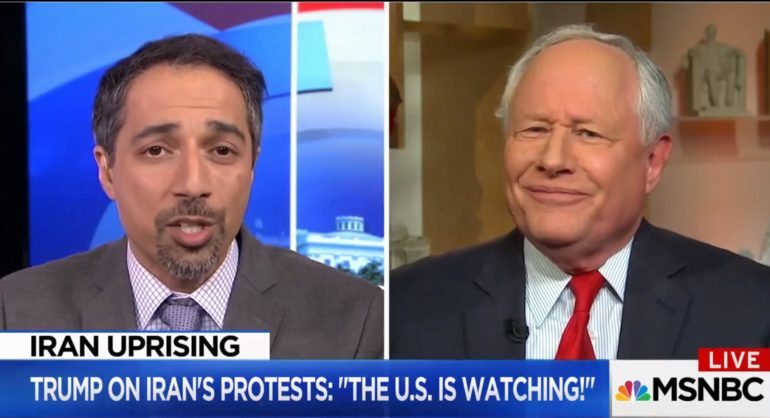 On MSNBC, Parsi took aim at Weekly Standard founder Bill Kristol’s calls for the U.S. to support the protests, by claiming Kristol actually wanted war against Iran. In the Hill, Parsi claimed that President Trump’s calls to support the protestors was meaningless because the president’s opposition to the nuclear deal made him lose credibility with the Iranian people. “He has no popularity, no credibility on Iranian streets,” Parsi said. Parsi added that the president would better demonstrate his support for the Iranian people by lifting any travel restrictions against Iran. Meanwhile in Politico, Parsi claimed that the president was taking advantage of the situation to boost his own flagging political fortunes. The dizzying number of appearances and competing messages and theories put out by Parsi could leave even experienced foreign policy analysts baffled, but this is Parsi’s only strategy left to him and his allies. The fact that Parsi is offering different ideas on how to react to the protests in Iran lays bare that Parsi has no rational ideas to accurately describe what is happening there without validating the real reasons for these protests: the Iranian people have had enough of the mullahs. These protests grew organically and spontaneously. They are not being led or organized by any political figure from within the regime’s power structure like the 2009 protests. These protests are being staged by ordinary Iranians from middle and working classes who have borne the brunt of the wartime economy top mullah Ali Khamenei has mandated and have offered up their sons, brothers and fathers to fight in distant wars far from Iranian interests. In many ways, these protests represent the most serious threat to the Islamic regime because they are coming from the bedrock base of the country who comprise the farmers, laborers, workers and small business owners that make the Iranian economy run. This explains why Parsi is in a pickle. He cannot discount the source of these people’s discontent without looking like a complete idiot and he cannot affix any real blame to the regime leadership’s inept and corrupt governance since they are his titular bosses. Which is why Parsi and the rest of the Iran lobby are busy trying to blame anyone except the regime itself. Parsi’s NIAC colleague, Reza Marashi, has been just as busy as this all-hands-on-deck exercise has NIAC staffers churning out commentary at a level not seen since the heady halcyon days of the Iran nuclear deal’s debate two years ago. Of course, in the same breath, Marashi and his allies denounce long-time representatives of the Iranian resistance movement, such as the National Council of Resistance of Iran, from having any part in these protests and if they did, it would only serve to de-legitimize them. Marashi then is trying to have his cake and eat it too in claiming no leadership to these protests and denying that any leadership it might have is in fact illegitimate. Khamenei meanwhile was busy trying to blame President Trump for all of his regime’s ills even as protestors were busy tearing down posters bearing his likeness; an almost unthinkable act where such actions are punished harshly. Marashi, in a CNN interview, even tried to split hairs by saying “I don’t think you can separate the economic from the political,” when describe the source of protests stemming from people’s desperation over high food costs and a moribund economy. It is no surprise that when Marashi was at the State Department during the landmark 2009 protests that were brutally put down with regime security forces ruthlessly shooting and killing protestors in the streets, the U.S. government’s official response was to do nothing and allow the mullahs to kill their opponents. Now that the Iran lobby finds itself on the outs of a U.S. government led by President Trump firmly opposed to the rule of the mullahs, Parsi and Marashi are casting about wildly for any defense of the regime and hoping U.S. journalists are too dim-witted to see the falsehoods in their comments. But not everyone is bought into the regime lines of attack. A columnist for Bloomberg, offered up a litany of actions the U.S. and its allies could take to help support protestors and pressure the mullahs including boosting efforts by banned social media platforms such as Telegram, Instagram and WhatsApp to work around the regime’s blackout efforts. Let’s hope the U.S. never stays silent in supporting Iranians fighting for their freedom.